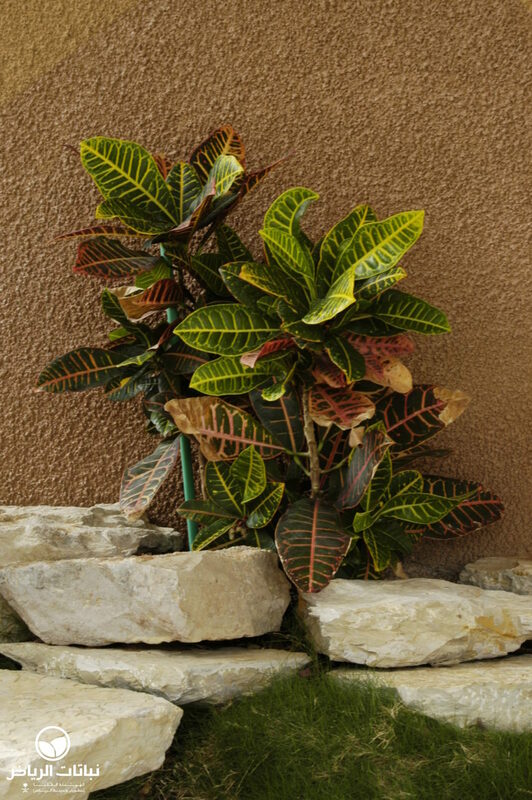 Better known as Croton, this evergreen shrub is widespread as a highly ornamental bush for the garden or as a popular indoor plant. It originates from India, Sri Lanka, Malaysia and Indonesia, where heat is accompanied by high atmospheric humidity and rainfall; hence, it demands abundant water. In Arriyadh, it withstands the sun and dry air relatively well, but requires a position sheltered from desiccating winds. The soil must be rich in humus and well drained. 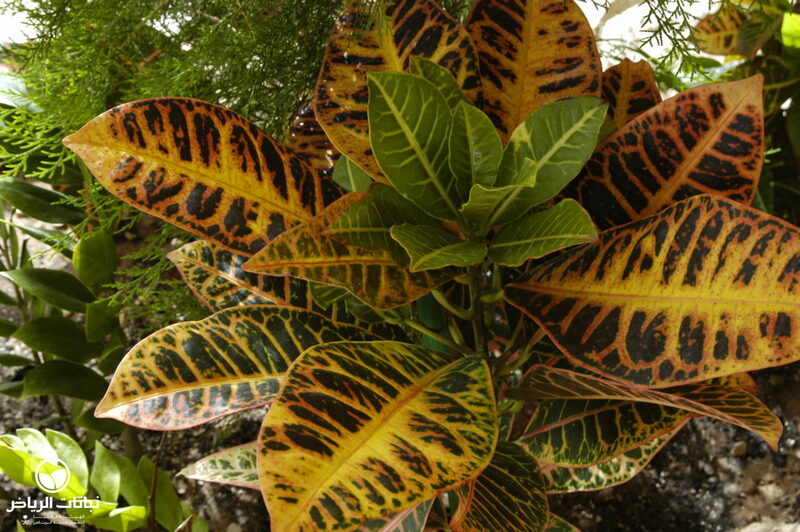 Crotons grow their colourful foliage in partial sun. 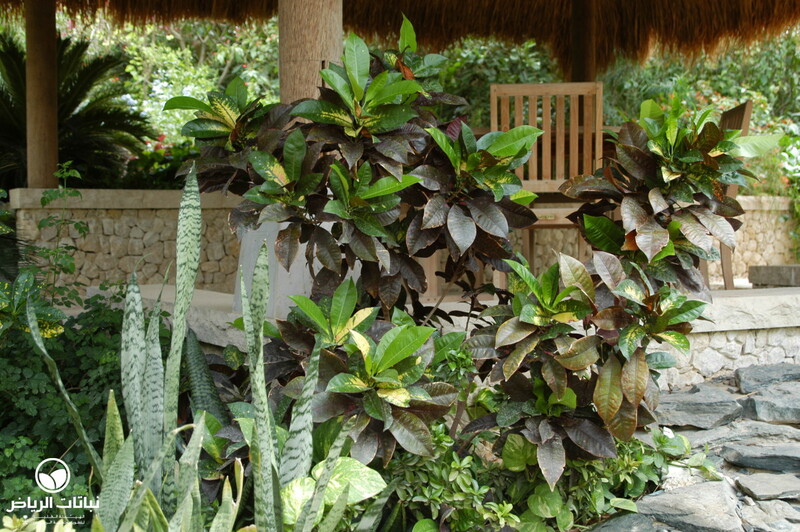 High contents of nutrients and high temperatures may reduce the number of bright spots. 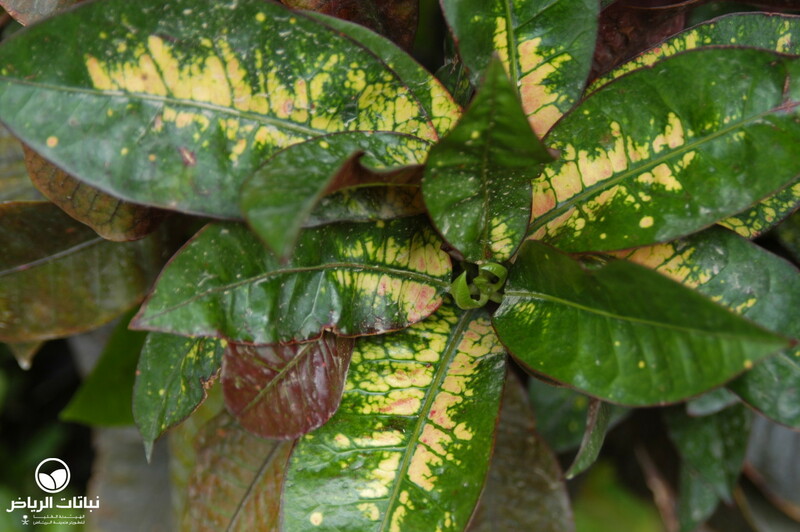 Full sun bleaches the colours, while a lack of light results in greener leaves with less yellow or red spots. 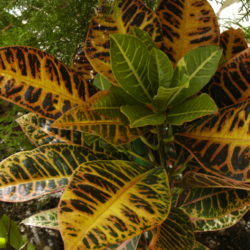 The intensely mottled foliage is shiny and attracts the eye from far, the major asset of Crotons. 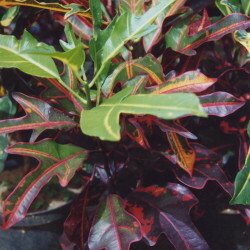 Plenty of varieties are bred such as ‘Petra’, with yellow veins and red shades alternating with green. Its white flowers are insignificant. 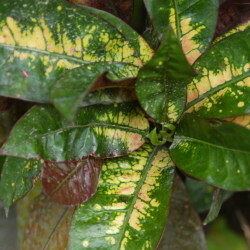 Favourable conditions let it grow into a V-shaped bush of about 2.5 metres high and up to 2 metres wide. High levels of humus are important, and it should not be exposed to drying winds. 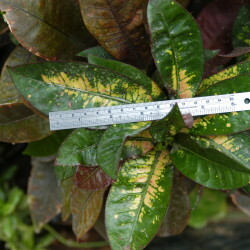 Severe cutting back is possible in early spring, if frost has damaged the leaves. 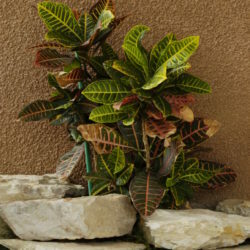 It does well in containers, is an ideal indoor plant and makes excellent focal points or colourful hedges. 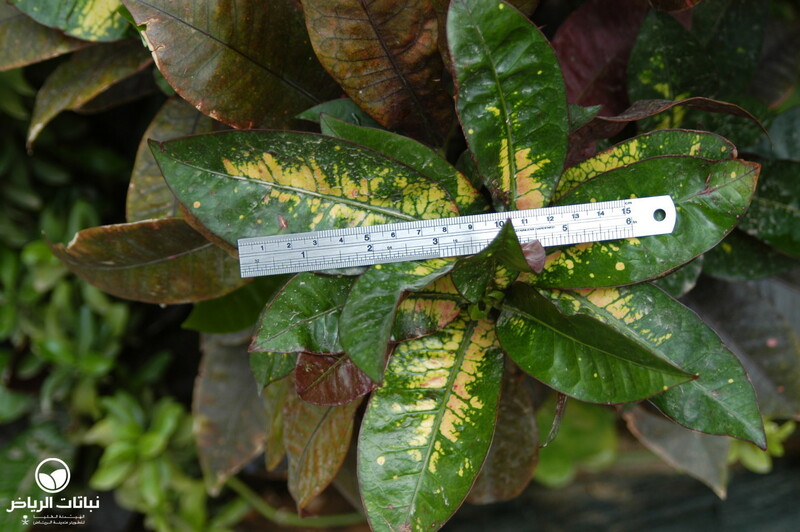 Stressed plants may occasionally be infected by mealybugs or scale. 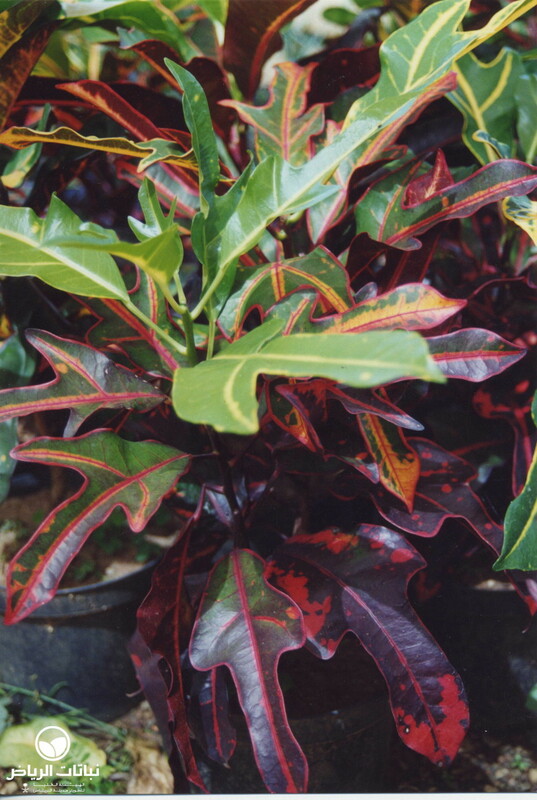 Both cuttings and layering make for strong offspring easily. 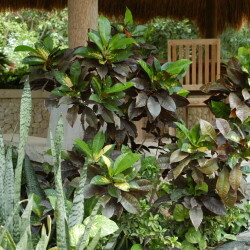 In public gardens, it may as well be too exotic, but should be restricted to special sites.